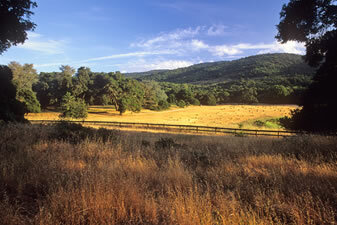 The Filoli Nature Preserve occupies most of the acreage beyond the House, Garden, orchard and parking area. It is an outstanding area for nature education, offering a variety of ecosystems within a compact area including oak-madrone forests, redwood stands, chaparral, riparian zones, a pond and cultivated grasslands. The preserve also contains historic Filoli sites such as the Bourn family cemetery, the Italian bachelor gardener dormitory (not open to the public), and old barns including one that has been converted to a classroom. Wildflowers typically are in bloom from February through early summer. While many of the animals are nocturnal or elusive, deer, banana slugs and lizards are regularly seen on hikes. Many of the birds and mammals found at Filoli are displayed at the Sally MacBride Nature Center. A portion of the preserve is accessible only through docent-led hikes on a network of trails and historic roads. The Estate Trail and Sally MacBride Nature Center are open to self-guided hikes. Experience the beauty and tranquility of Filoli’s Nature Preserve while viewing the wildlife and plants in their native habitats. Nature Education Docents lead hikers through chaparral, oak woodlands, riparian corridors, and redwood groves. Hike routes vary based on season and theme. Return every week for a new look at these ever-evolving ecosystems! Advance registration is available through the Visit page.